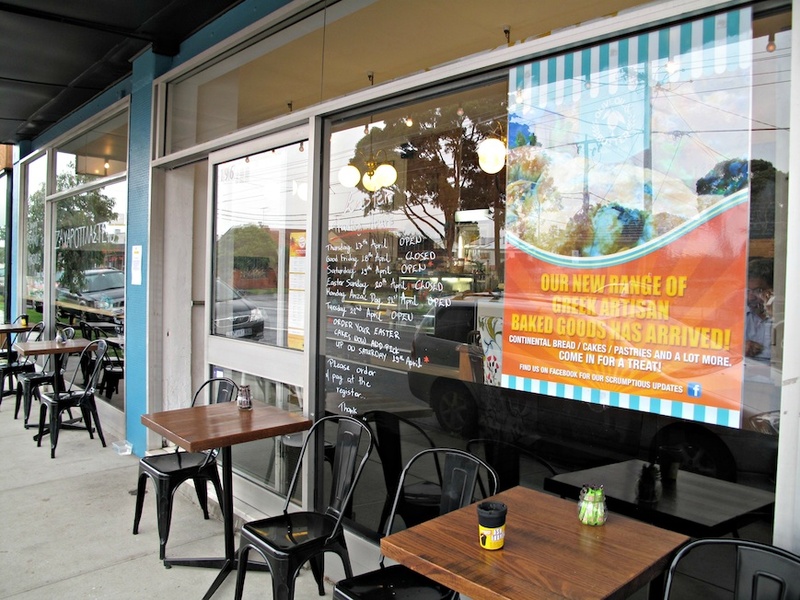 There’s an awful lot in the name of this great Greek bakery in Kingsville. You see, that’s what they use – olive oil and butter. Oh, of course, there’s other ingredients – but the name nevertheless symbolises a keen dedication to natural products. No ingredients with numbers rather than names, no premixes … just a righteous determination to make and bake with the simplest and the best in an entirely old-school manner. This is the kind of place at which the declaration, “Our products have a limited shelf life”, is a proud boast. Olive Oil & Butter is run by Pelagia, her brother Chris and their mum Martha. 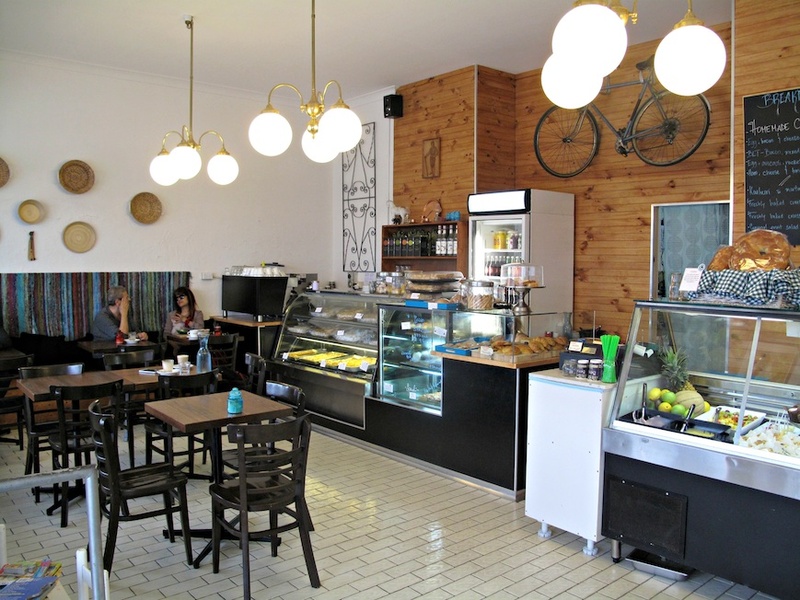 It’s a first restaurant/cafe/bakery outing for the family – and that’s a good thing, as it means the recipes are derived from an inter-generational tradition. 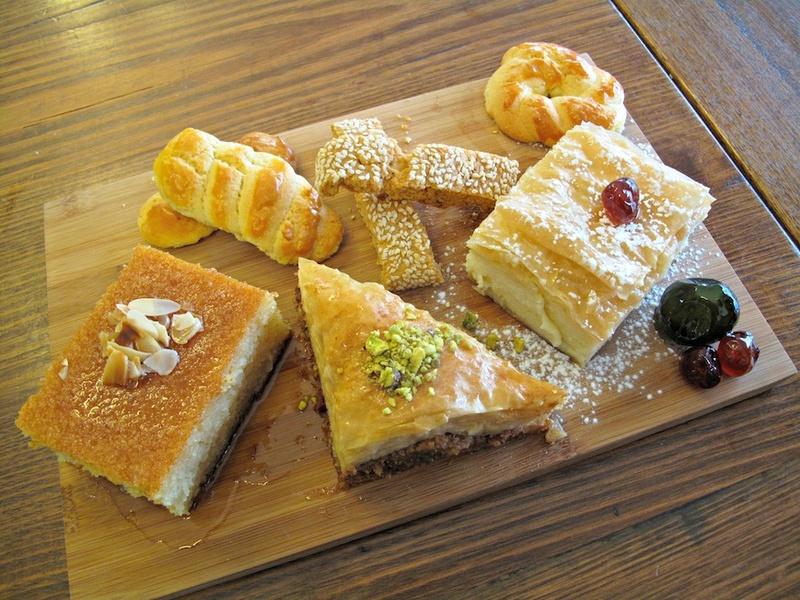 After my lunch is done and paid for (see below), I introduce myself to Pelagia, who is nice enough to set up a display platter of the Greek baking that is available this day. 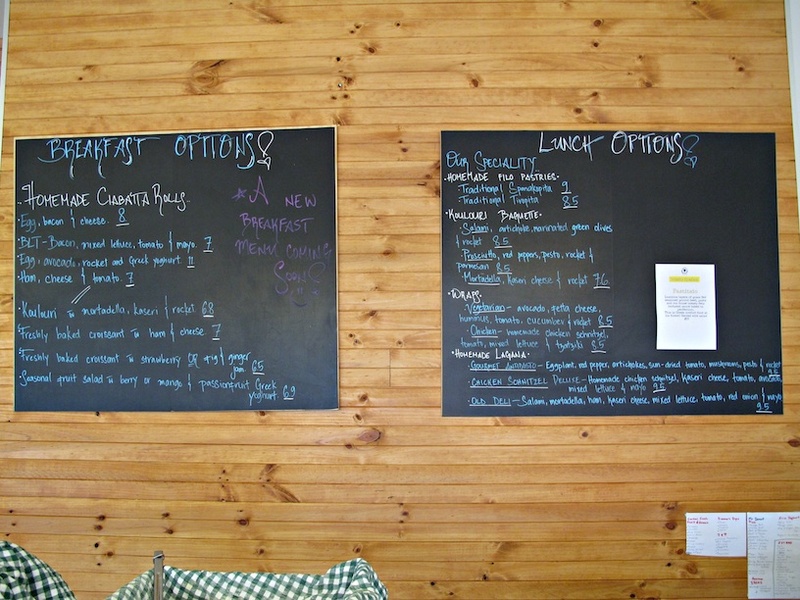 The line-up tends to change, but the prices are mostly in the $4-5 range (less for biscuits). * Koulouraki – biscuit with vanilla. * “The best” galaktoboureko – Filo pastry, semolina-based custard, vanilla, syrup with cinnamon and cloves. * Baklava – roasted almonds and walnuts filling filo pastry with a cinnamon and clove syrup. * Revani – semolina cake flavoured with lemon and orange sweetened with an orange-zest syrup. * Another version of koulouraki. * Paksimadi – a crumbly vegan biscotti flavoured with orange. As Pelagia explains the ins and outs of the baking before us, we are joined by her mum. I try only a few of the above assortment – they’re delicious. The rest go home with me – it doesn’t take too long for me to realise my insistence on paying for the lot is going to be rebuffed at every turn, no matter how hard I try or how long I persist. Olive Oil & Butter does breakfast and lunch, too, though much of what is available in that regard is of non-Greek derivation – pies, muffins, focaccia and so on. 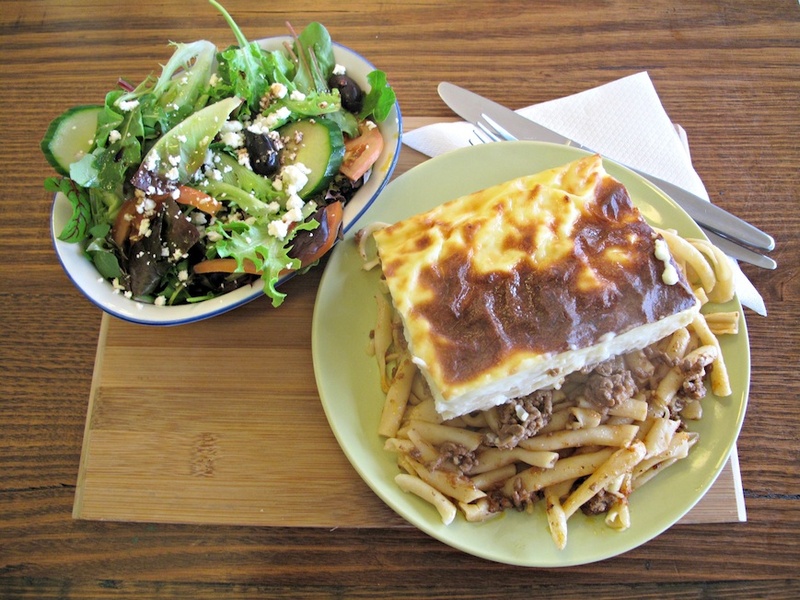 I do enjoy my pastitsio ($15), though. It’s a hearty dish that is something of a variation of moussaka, with the good ground beef and tubed pasta melding into the rich bechamel sauce. The accompanying salad is just, fine, too. And for dinner, I am also gifted this gorgeous scroll-style spanakopita ($9). 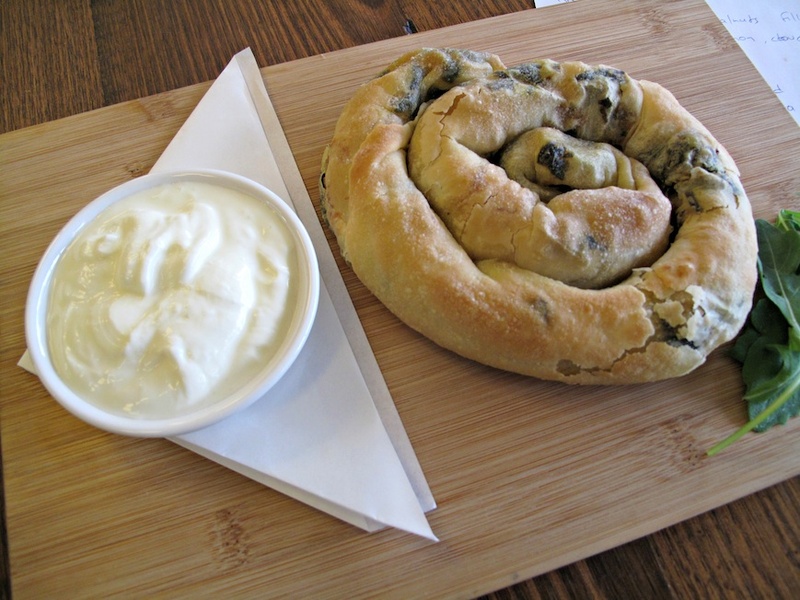 Like the bakalava and its variations (katafi, gianniotiko, saragli), the cheese and spinach scroll is made with filo pastry that is made from scratch in the kitchen. My two cafe lattes ($3.50) are excellent, BTW! PS: I will update this post with “tasting notes” as I work my way through my trawl! The Olive Oil & Butter Facebook page is updated regularly with news and photos of what is available. You immediately had my attention at ‘olive oil and butter’ – I love ‘real’ ingredients and things which aren’t afraid to add fat. Check it out! Addressed changed – besides, I think it’s somewhat “disputed” territory!